I firmly believe in the power of bedtime reading. As a parent of two (ages 10 and 6), I love our bedtime reading routine. Years ago we read a couple of picture books before bed every night. These days, we’re always in the midst of a chapter book, often an extensive series. The shared experience is powerful and it’s a great way to get our girls set for sleep. I teach in a wealthy, suburban district. My school, however, is a Title I school. About 75% of our 700 students receive free or reduced price breakfasts and lunches. More than 60% of our students are officially still learning English, many more speak multiple languages. Our school does some fabulous evening events for families. 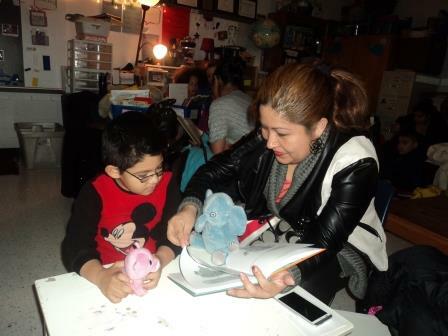 We have done a variety of literacy evenings for primary grades, state standards events for upper grades, multicultural evenings, and talent shows. We invite families into school in as many ways as possible. I decided this year that I wanted to do events in my own classroom for my students and their families. My theory was that families would be more motivated to attend an intimate event in their child’s classroom with their child’s teacher. In addition, I thought I could learn more about my students in this way and share strategies for supporting kids in a low-key manner. 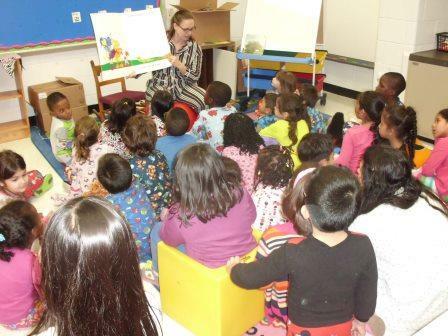 One goal for an event was to help parents see the benefits of bedtime reading. Many parents of young children support them as readers but don’t know how best to do it. I didn’t want to lecture to parents about it, but to talk to them as they read with their children. When I mentioned this idea, a couple of my teammates jumped on board. The three of us worked together, with the support of our administration, to plan a great evening. 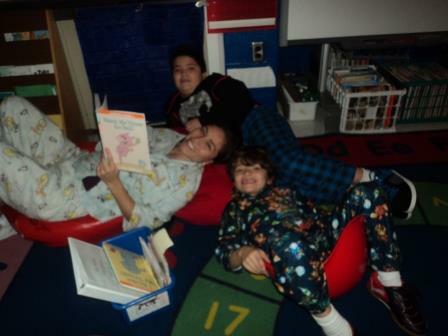 We invited families to come in their pajamas and we wore ours too. In the beginning of the evening, as families were arriving, we started together in a resource room. 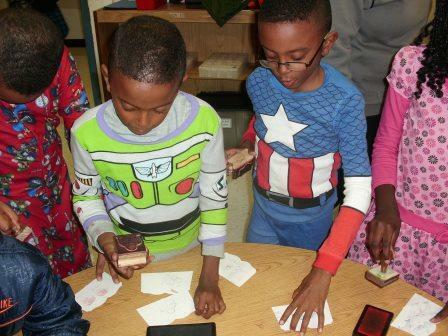 The kids got the chance to stamp bookmarks and I read them a big book. At 7:00 pm, we headed into our own classrooms. In each room, we shared a brief video of bedtime reading. The video was taken by one of my students last year. She recorded her mom reading to her brother and her mother recorded her reading to her brother (lucky boy!). 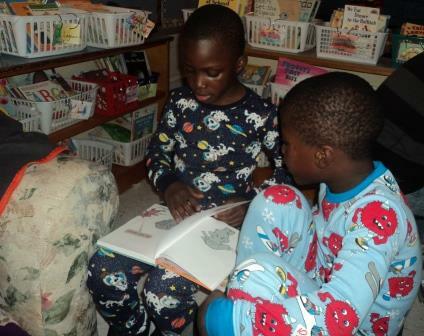 We used the video to show what bedtime reading looks like and to highlight the fact that parents reading to kids and kids reading to parents are both fabulous things to do. Then the students grabbed their book boxes, and for the next twenty minutes, families read together. We got to walk around, listen to reading, talk to families about books, recommend strategies and books, and generally have a great time. Some kids picked up or brought a stuffed animal to include in their bedtime reading. One mom, after I told her how impressed I was with her daughter’s reading this year, shared with me that her daughter invented ‘power hour’ at their house. Apparently, for the hour before bed (or however long an hour feels to a six year old) they gather books and read, moving from the girl’s bed, to her brother’s, to the parent’s. At first, her younger brother didn’t like it, but now he loves it too. Just before 7:30 I stopped everyone in my room and heard several voices, young and older, say, “Really? Already?” Success! I stopped them because we had brand-new books to give each child. 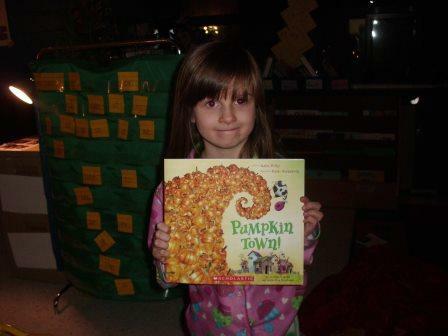 Every first grader and each of their siblings got to take a book home to keep. We had ordered books at a variety of reading levels in order to have something for everyone. We gave away nearly fifty books. By the time everyone left and I got home, I was grateful to be in my pajamas. I crawled into bed, exhausted but jazzed by the time spent with my students, their families, and books. Jenny Orr teaches first graders at a Title I school in the Virginia suburbs of Washington, D.C. Her nerdy book clubness is not only shared with her students but her two young daughters as well. She is a national board certified teacher and a teacher consultant with the National and Northern Virginia Writing Projects. She and her students blog about their learning athttp://exploreorrs.terracetimes.com and she writes without them athttp://emdffi.blogspot.com. If you show them, they will know how. What a great concept! Awesome idea. I think I’m going to share this with the literacy team at my school. Our demographics are very similar to yours. What I great idea! That was brilliant to realize that parents would make a bigger effort to attend a smaller, more focused event. It also never occurred to me that someone might not know what bedtime reading looks like – what a sensitive teacher to realize that! I’m amazed at how often I assume kids (or adults) understand something that they don’t. Things a always better when I question my assumptions! I love this. Bedtime reading is a traditional that I so enjoy with my 10 month old. (when she lets me) It was my favorite as a kid and I hope it is of hers too. Amazing – your imagination and devotion to your kids is inspiring. As was the way the students and their families responded. This is teaching at its very best. Rock ON. I imagine this could also be done at a library! We actually had our librarian involved in the planning and are talking about future events involving her. I’d love to see public libraries do something similar too (I’m sure it’s being done.). Great idea, Jenny! Thanks for the tip. You really know how to invite parents to be part of their children’s reading journey. So awesome. What a great event. Am I too old to be in your class? This is incredible – What a way to show the power of bedtime reading rather than telling about it. Jenny, if you are not a member of the Greater Washington Reading Coucil, we sure could use your great ideas for Community Outreach! This would be a wonderful article for the annual journal, too! Did your adminstration help buy the books for the give away? I am a member of GWRC (or at least I was last time I checked)! I’d love to talk to you about this. Our admin did buy the books for us to give away. We’re looking for grants in hopes at expanding this. If you see this, you can email me at jenorr at gmail dot com. Thank you all for such kind comments. This event was two weeks ago and it still has me feeling on cloud nine. Your comments have just increased that feeling.